Let’s talk about hosting videos for websites, online courses, and premium content. The most obvious choice for a video hosting platform for most content creators is YouTube. It’s free, easy, and is a massive social network in and of itself. Not only that, but the service also represents the #2 search engine in the world behind google.com. So hosting your videos is free, easy, and gives you access to a massive network. Ever wonder how you ended up spending the whole afternoon watching cats videos on YouTube? It’s not you; it’s YouTube’s built-in addictiveness. YouTube has a ton of features that make watching similar videos easy and addictive. Its algorithm is designed to make people stick around. And that’s what we want: for viewers to quickly find our content and keep on consuming them. If you are looking for exposure to your work, you can’t go wrong sharing on YouTube. But when it comes to premium and proprietary content that you don’t want to share? Hosting with YouTube works against itself. While YouTube does have some basic privacy functions, I never considered using the service to host my premium, paid content when I started with online courses in 2014. I don’t trust YouTube for hosting premium videos. Why? Because YouTube is free, easy to discover videos and addictive. Of course, these are the precise reasons I love YouTube for marketing purposes. Accessibility is not a feature you want to see in guarding premium content. I need a premium solution with better privacy features. We use YouTube for marketing purposes, and Vimeo Pro to guard premium content under lock and key. Vimeo Pro is ideal for hosting premium content. Let’s get into the reasons why Vimeo Pro is a superior option when it comes to guarding our course video content. Vimeo pro makes storing our entire course library a breeze. Here are some of my favorite features, as well as some areas where I think Vimeo could stand to improve. You can configure privacy settings on a per-video level. You can determine who can watch which of your videos. Not only that, but you can also choose whether a video would be available on Vimeo (to the public) or if the viewer needs a password or even a private link to watch it. You can also decide where the video can be embedded. These features help prevent piracy of video content. A Vimeo Pro account allows you to use your own branding. We can choose to place our logo on the player or no branding at all. In many cases, adding a logo can be distracting, so we decided to display nothing. 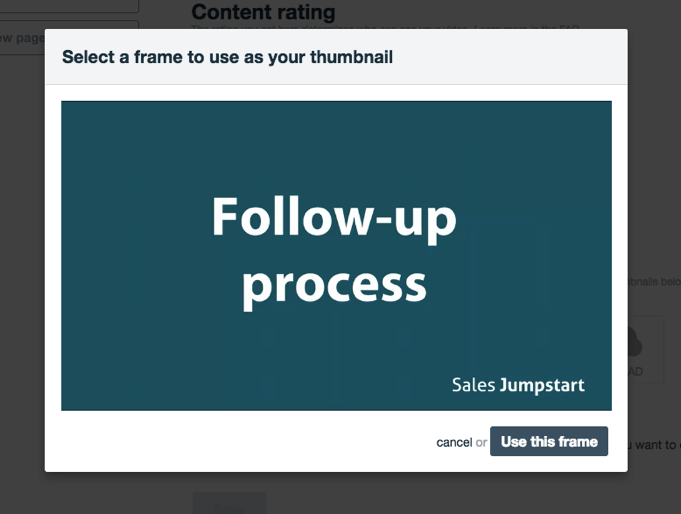 You can create a video thumbnails from a video frame easily. The thumbnail you choose will look exactly like the video frame selected in this process. Embed codes are also lovely. You can remove sharing buttons, embed options, and other overlays from the videos. These are very cool features of Vimeo Pro that are not found natively on YouTube. The ability to make video embeds as basic and boring as possible was a significant factor in my initial decision to use Vimeo Pro. While pinpoint control for individual videos is excellent, you can also configure upload defaults. These default settings will be applied to every video we upload. We want to hide video stats from search results, for example. This is to make sure they are not identifiable or visible to people searching for them. And we want to consistently have this setting in place for each of our videos. We can do that by configuring the upload defaults. We can upload our videos directly from Dropbox or another third party cloud service like Google Drive. 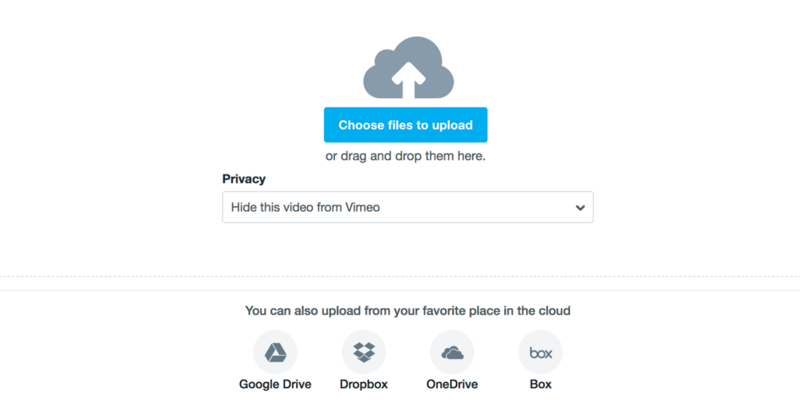 Once we’ve connected our Dropbox account, the videos selected will upload directly to Vimeo. With this feature, we don’t need extra bandwidth to download videos from one team members computer and upload them from another location. With just a click of a button, our chosen videos from Dropbox appear in our Vimeo account. 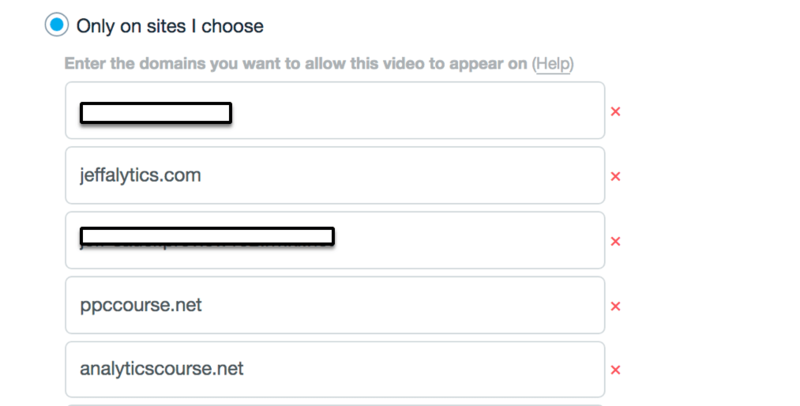 We can customize embed settings and privacy for each video. These are controls that appear at the bottom and top-right of the video. We can choose to display the play button, volume, speed and so on. This feature comes in handy when you want viewers to watch the full length of the video and not skip ahead, for example. 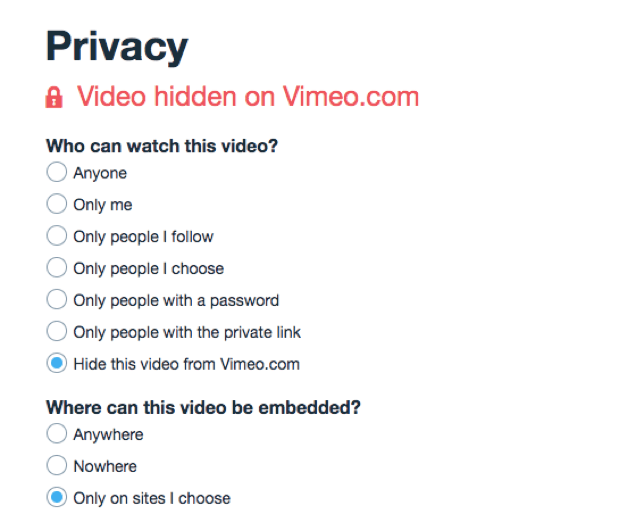 Another privacy feature is you can choose which site to display your videos. This feature relates to a previous point we made, which is controlling which domain to allow the video embed. In our case, the videos only play on the sites we choose to list. It won’t even play on Vimeo.com! You can easily replace videos with a different version and continue to use the same video URL. Just hit “replace video” and upload the new version. The new version will show up everywhere you have embedded the video. This “replace video” feature is much more user-friendly than how things work on YouTube. If you replace a video on YouTube, all your stats reset! The simple organization feature is helpful to compile and give structure to your video collection. The folder and albums feature works well when you’re working on multiple projects and have many videos in your account. Vimeo Pro has a generous weekly upload limit. They allow you to upload up to 20GB of video files each week. We don’t have any problem staying under quota even during our course production period. Even when we are producing and uploading 10-15 videos in a week, we have yet to run up against that limit. If we did hit that limit? We have the option to upgrade to a higher threshold when needed. The Vimeo Pro account is a flat-out bargain when compared to Wistia, which I view as one of their more significant competitors. The Vimeo Pro membership costs about $20 per month, and it is quite reasonable for video hosting services. 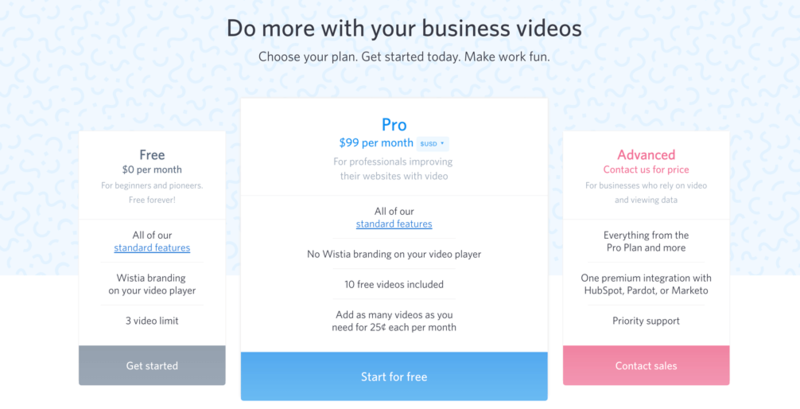 Vimeo Pro is a steal if you compare it to Wistia, which has a similar set of features for $99 per month. That’s 5x the price, and Wistia even charges for every video uploaded. That’s crazy talk! The only advantage Wistia seems to have over Vimeo Pro is that Wistia is well known for being great at SEO. Your videos will get more search traffic if you’re hosting them on Wistia. But that’s not what we want to achieve. That’s the opposite of what we want. We don’t want search engines to know about or find our premium video content. Vimeo Pro has been precisely the video service we need for hosting our course content. And I like that they keep on making upgrades and improvements to the product. Some of these improvements are features that we desperately needed. For example, Vimeo enabled video speed controls on embedded videos in between the time we recorded this review, and it went live. Awesome work Vimeo! But as with any piece of technology, there is always room for improvements. Here are the top 4 features I think Vimeo Pro can improve on. There is piracy protection in place, but I would like to see more of it. Ideally, there should be further measures taken to limit unauthorized downloads or block sharing capabilities. We want the ability to protect our premium content even more because our content has been stolen in the past. This might be a pipe dream but I would still hope to see it happen. 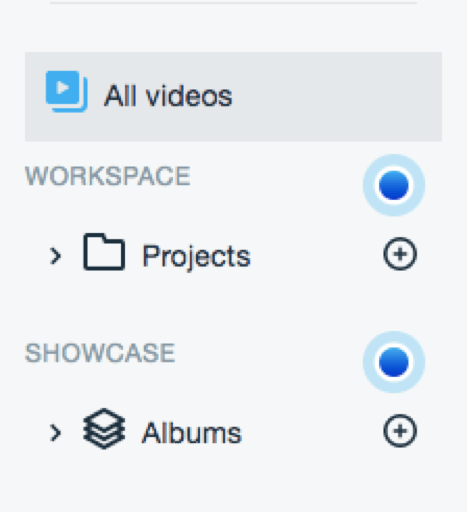 Although there is a feature to organize videos in folders or albums, Vimeo Pro should further improve their organization features, especially for accounts with tons of videos. We have a lot of videos, and it feels like we have to scroll through pages to find a single video. The Ajax interface that requires clicking on a Load more link 50 times is frustrating! If we don’t name our video files in a very thoughtful way that we can quickly search, it’s almost impossible to find anything without scrolling chronologically. We find it particularly frustrating when we’re trying to update our older videos. The reports provided by Vimeo are a bit too fancy for my taste. It’s more style over substance. The total time watched, for example, displays as a crazy digital clock. C’mon Vimeo! Stop trying to make things look fancy. 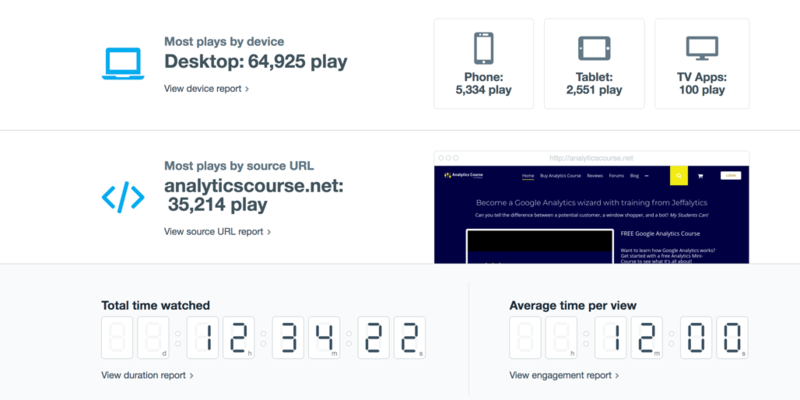 Build an analytics tool that is actually helpful. Vimeo videos do not work in every country. I’m undecided whether this is good or bad. On the one hand, blocking certain IPs might stop piracy. On the other hand, I would like to have a choice for locations to block. For example, I could not access my videos when I was in Indonesia last year, because Vimeo is blocked in that country. This can have a negative impact on our business since we have had to turn down or refund students from these countries. Another feature that is on my wishlist is watermarking videos, which is another feature that would help us protect our content. All in all, Vimeo Pro is absolutely a video hosting tool worth trying. The feature list is well worth the price they charge, and there is room for expansion as our needs grow. If you’re in the market for a premium video hosting service for your online course videos, you should definitely give Vimeo Pro a try. This post and video was episode 84 in our 90 Day Challenge digital marketing series.